It’s the Most Wonderful Time of the Year, so break out the cocoa, the coffee, and cookies! Grab those holiday theme books and bring your holiday spirit. 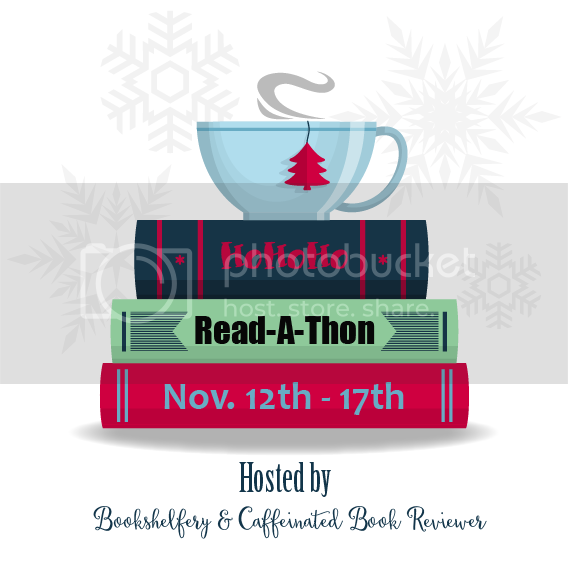 Kimba @ Caffeinated Book Reviewer and I are hosting the Ho-Ho-Ho Read-A-Thon for the third year in a row and we are excited to get together with you! Prepare to enter challenges, win prizes, meet new friends and Twitter chat with us. You can join for a day or sit by the fire and hang out every day. The more you participate the more entries you will earn for the Participant Giveaway. As always, we are looking for Challenge host please email, tweet or message Kimba or myself. We have posted early so that you have plenty of time to find those holiday/winter reads and clear your schedules. We love holiday themed reads from the covers to the warm & fuzzy tales on the inside. For this read-a-thon you must read holiday themed or winter setting reads. For bloggers, we have spoken to most of the main publishing houses and for ARCS of holiday books released in Sept/Oct, they are fine with you posting a review in November and December since that is when folks look to buy them. Below are the rules. Read them, grab the button and link up. For our non-blogger friends you can join too. Just link your Goodreads, Tumblr or Facebook account. Looking forward to spending time with you. Grab the button and spread the word. The more folks who join in the merrier. You can even plan a get together with local friends or buddy read with fellow bloggers. Just add hot cocoa! Hey, one book during school counts! Tell me about it! I’m thinking about signing up. I’d probably get one done, too. Time to crunch on assignments and see what happens!